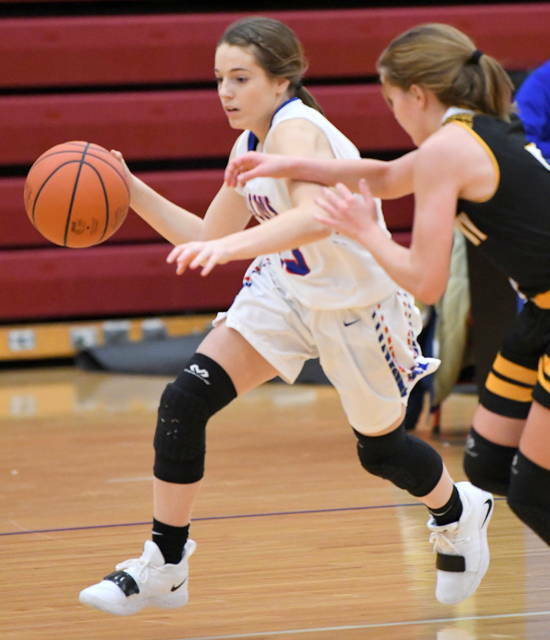 ADAMS TOWNSHIP – Miranda Crawford’s hoop, and one, and steal in the final four seconds helped give Clinton-Massie a 49-47 senior night victory over cross-county rival East Clinton Monday. Crawford finished with 10 points and was one of four Falcons in double figures. Faith Cottrell led the way with 13. Patience Chowning added 12. Kenzie Avery chipped in with 10. Their efforts spoiled a 23-point performance by EC’s Mackenzie Campbell. She only had two points in the fourth quarter, a pair of free throws with 35 seconds left in the game that put the Astros up 45-44. Massie retook the lead, 46-45, eight seconds later on a pair of Chowning charity tosses. EC (7-11) regained the lead, 47-46, when Kaitlin Durbin drove the lane for two. There were four ties and five lead changes in the final period. Massie (6-13) never led until a Crawford bucket made it 41-39 Falcons with 2:55 left in the game. Campbell had three threes and an old-fashioned three-point play in the first 9:31 of the game to stake the Astros to a 19-9 advantage. Like the little engine that could, CM huffed and puffed its way back into the game, eventually knotting the game at 28. EC responded with the seven of the next nine points to go up 35-30, but that lead went up in smoke when Massie returned the favor with seven of the next nine points to make it 37-all. EC’s Lacey Peterman also reached double-figures with 11. (47) EAST CLINTON (fg-ft-tp) Campbell 7-4-23, Durbin 2-2-6, Peterman 4-2-11, Creachbaum 1-0-2, Boggs 0-1-1, Bowman 1-2-4. Total 15-11-47. 3-point goals: 6 (Campbell 5, Peterman). FTM-FTA 11-13, 85 percent. (49) CLINTON-MASSIE (fg-ft-tp) McK. Crawford 0-0-0, Cottrell 4-2-13, Greathouse 0-0-0, Ireland 1-2-4, Avery 4-2-10, Lay 0-0-0, Mir. Crawford 3-4-10, Chowning 4-2-12. Total 16-12-49. 3-point goals: 5 (Cottrell 3, Chowning 2). FTM-FTA 12-13, 92 percent.